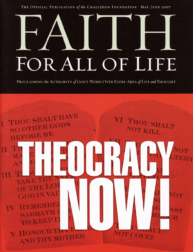 Helping Christians apply the Word of God to all | Chalcedon Foundation Theocracy NOW! False theocracies are the rule of men; true theocracy is the rule of God’s law in men and over men. True theocracy requires a very limited church and state. Giving more power to men, either privately or institutionally, is no substitute for the rule of the triune God in the lives of men. People told my father, Rousas John Rushdoony, that Chalcedon was a mistake when he formally began it in 1965. The problem, they said, was that it was dedicated to an idea, one so broad and sweeping that its mission would be too hard to define or inspire financial support. When I was young, I lived in the suburbs of New Orleans. Even though our neighborhood was pretty quiet, I always knew that I had to lock the doors and not talk to strangers because New Orleans was a city with a lot of crime. Is Profit Compatible with Christian Ministry? Profit has been a suspicious word for Christians for many centuries. Perhaps it seemed that in order to gain a profit from a transaction, the other person had to lose. Does the acquisition of factual knowledge about religion lead to an understanding of religion? Richard Dawkins has recently argued that God is a delusion, but a vicious problem attends his case: if God is a delusion, then so is Dawkins and everything else.